On September 25th, 193 world leaders will gather at a UN summit in New York to commit to 17 Global Goals to end extreme poverty, improve access to health and education, and eradicate disease in the next 15 years. This is history in the making and you can be a part of it! To mark the occasion, citizen advocates from across the world are invited to join a RESULTS webinar with Dr Jeffrey Sachs, a leading economist in the fight against poverty, to discuss these new development goals. Join us on September 27th from 12:45-2:00pm EST to hear firsthand from Jeffrey Sachs on his experience at the summit, ask questions, and share comments. 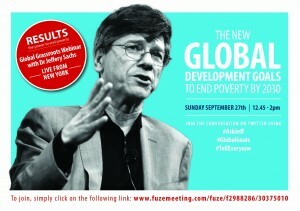 You can join the webinar at www.fuzemeeting.com/fuze/f2988286/30375010 and on Twitter using the hashtags #AskJeff, #GlobalGoals and #TellEveryone. See you there!